Outstanding works of art by the great Dutch masters, including Rembrandt and Vermeer, come to Sydney this summer. Welcome to the world of art in the Dutch golden age. Here you will discover the stories behind the art, artists and era. From Dutch fashion to Rembrandt’s self-portraits, we explore what made this a golden age of art. 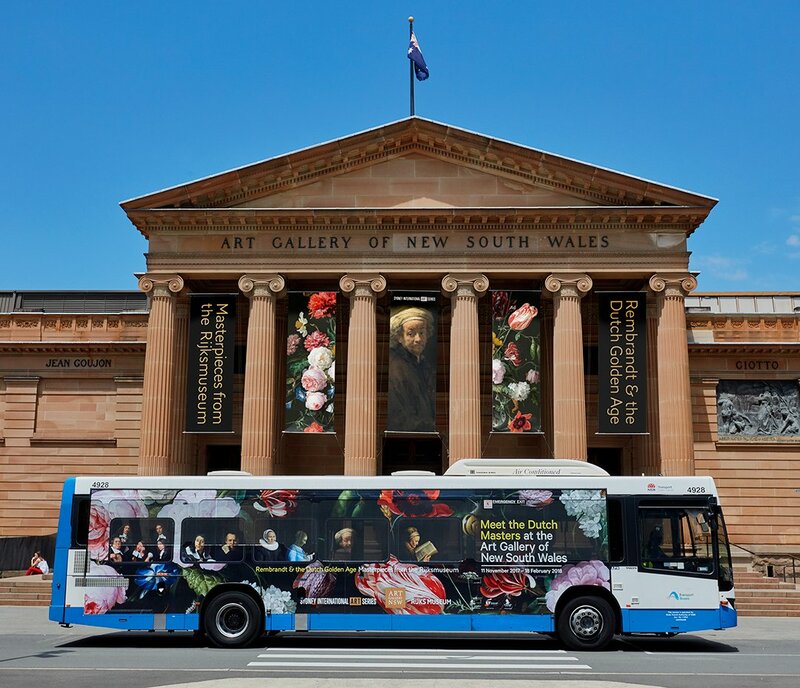 The richest exhibition of its kind ever to come to Sydney, Rembrandt and the Dutch golden age brings you face-to-face with some of the greatest masters in the history of art. In the 17th century, the art of painting flourished like never before in the wealthy Dutch Republic, home to thousands of exceptional artists including Rembrandt and Vermeer. In this exhibition of paintings from the Rijksmuseum in Amsterdam, you’ll discover the richness of art in the golden age—from characterful portraits to icy winter landscapes; from neat domestic interiors to sumptuous still lifes. And at the centre of the exhibition, you’ll meet the most celebrated master of Dutch painting, Rembrandt van Rijn. Does this painting out-do nature itself? Many Dutch still lifes are known for their intriguing mix of symbolic objects: skulls, candles or wilting flowers that signal the passage of time and the inevitability of death. However, this wasn’t always the dominant theme of the still life. 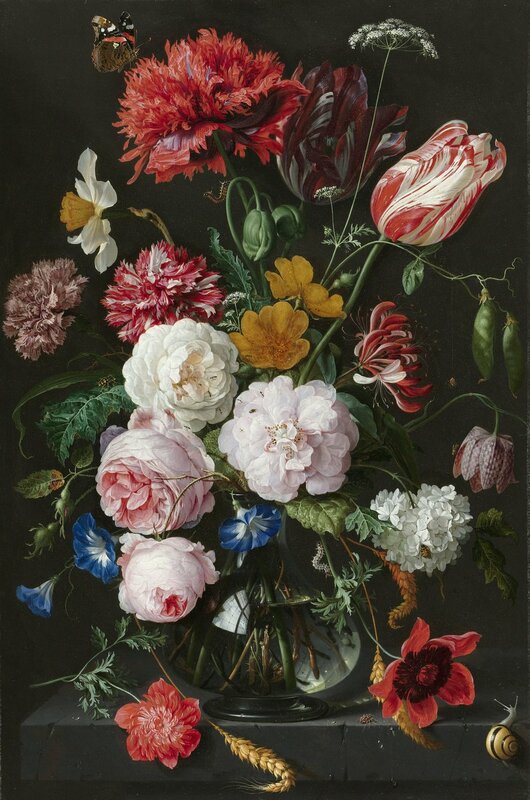 Flower painters like Jan Davidsz De Heem were celebrated for their ability to bring together flowers of different seasons into one painting, depicting them in a highly realistic manner and keeping them alive for centuries— evidence of the power of art to ‘out-do’ nature itself. De Heem’s particular skill at out-doing nature is evident in the smallest details: the stone plinth is riven with chips and cracks, and tiny droplets of water cling to its edges. Caterpillars crawl up stems, a butterfly settles atop an unusual type of poppy, and the pink and white roses are home to a tiny army of ants. Roses, peas, carnations, morning glory, prized tulips and more are carefully arranged, competing for our attention with their seductive colours. But perhaps most virtuosic of all is the painted reflection in the glass vase: a distorted window, complete with a view of the clouded sky beyond. Few paintings better capture the skill of Dutch painters to mimic and present nature as realistically as possible. About Jan Davidsz. de Heem De Heem was the most celebrated and influential flower painter in the second half of the seventeenth century. He had a workshop in Utrecht, where he employed several students, some of whom went on to become famous flower painters too. De Heem produced various types of still life, including vanitas (reminders of mortality and the passage of time) and pronkstilleven (sumptuous or ostentatious arrangements of food and luxury objects). He was the first to introduce the motifs of leaves and tendrils in pronkstilleven linking the beauty of nature to the extravagance of a prosperous table. His innovative compositions were highly desirable and valuable. He was paid two-thousand guilders for one of his works, among the highest prices ever paid for a painting during Golden Age. Dutch art from the 17th Century was made up of small, finely crafted paintings, often depicting the simple things in life. What made Dutch art from this era so special, what made it a 'Golden Age’? In what other country in the world can one find so many of the pleasures of life alongside all imaginable oddities? In what other country can one enjoy such total freedom? Who is Rembrandt dressed up as and why? Rembrandt’s face is unmistakable. He painted more self-portraits than any other artist in the seventeenth century, chronicling his life from ambitious youth to wise elder master. He created this self-portrait at the age of 55, portraying himself as St Paul. The apostle is known for his conversion on the road to Damascus, and for being the greatest defender of the Christian faith in the first century AD. The hefty manuscript in Rembrandt’s hands and the sword at his side are the traditional attributes of St Paul—referring to his writing about Christ and his martyrdom by beheading. It was quite common for people in the seventeenth century to take on the guise of an historical figure in portraits—identifying with a hero’s values or achievements. Rembrandt’s raised eyebrows and small, round eyes suggest a multitude of emotions. He uses light to pick out only the most moving or suggestive details: the furrowed brow, the distinctive, bulbous nose and the turban that exposes a tuft of wiry grey hair. Rembrandt’s emotional complexity—subtle yet dramatic—was his great achievement. And the personal connection he makes with the viewer in his self-portraits—gazing out at us from across the centuries—keep art lovers enthralled to this day. About Rembrandt Harmensz. van Rijn The Dutch Republic gave rise to a huge number of talented painters in the 17th century. Most specialized in a single genre, such as portraiture, still life or landscape. Rembrandt, in contrast, turned his hand to almost everything. From mythology and bible tales to landscape and scenes of everyday life, Rembrandt produced it all—and with great creativity and outstanding manual skill. He surprised his audiences (who included patrons all over Europe) time and again with original pictures and constantly experimented with style and technique. Many of his students went on to become the most successful painters of the golden age: Govert Flinck, Ferdinand Bol and Gerrit Dou and several others in our exhibition all started out in his studio. The quality of his work never dwindled: he remained active at a high level up to his death, aged 64. 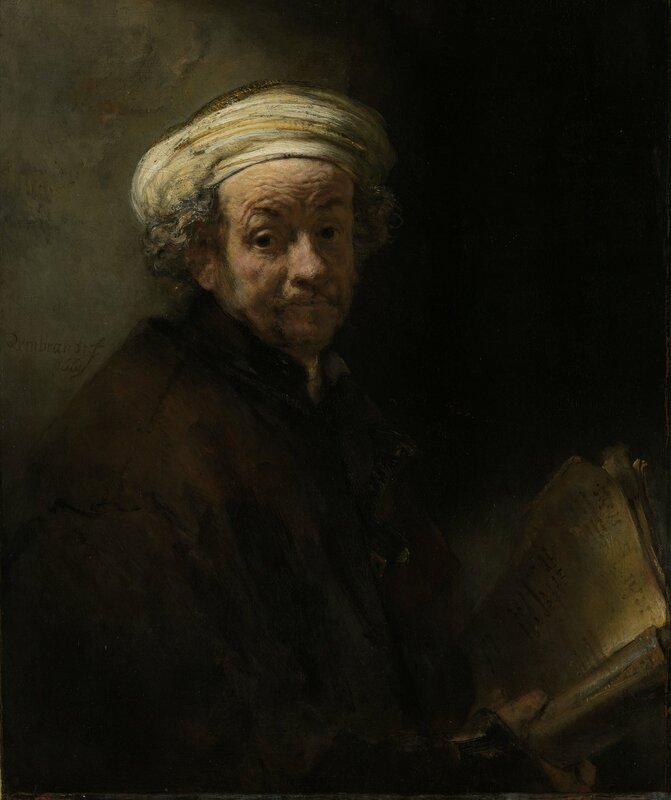 For good reason, Rembrandt's art was widely celebrated in his lifetime and still continues to affect and inspire us. A real place or a figment of the artist’s imagination? It was only in the seventeenth century that Dutch painters began to depict their local environment extensively. Unlike the idealised rolling hills and golden light of other European landscapes, Dutch paintings reflect the unique environment of the Netherlands with its flat terrain, cool light and abundant waterways. Artists captured the unidealized, rugged aspects of nature. But their compositions are not a direct, unfiltered recording of what they saw. They are carefully composed arrangements of the best effects they found in nature. 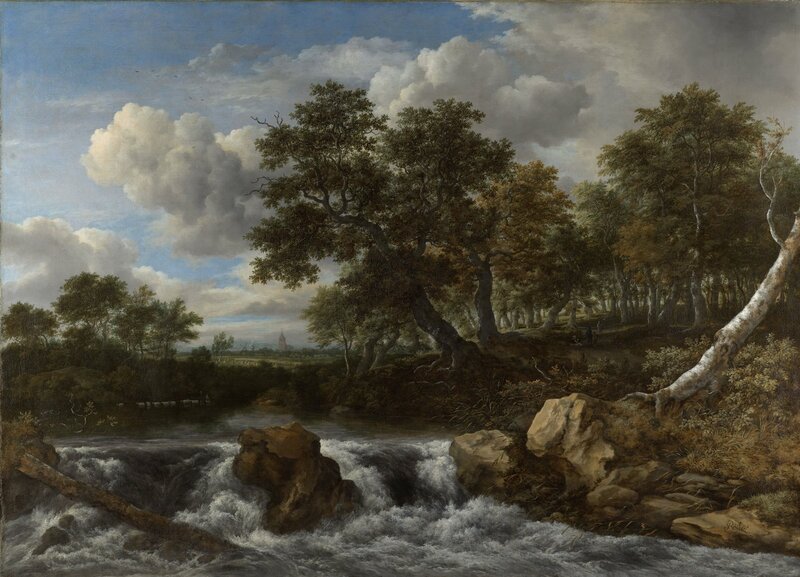 This large, dramatic work by Jacob van Ruisdael features white water rushing over craggy rocks at a drop in the middle of a river. On the far side of the bank, a gnarled old tree dominates the sky. Its meandering branches and dense foliage are painted so darkly that it is almost a silhouette. Underneath its canopy, tiny figures on the woodland path are all but lost—reducing the presence of humankind and emphasising the vastness and power of nature. As respite from this rugged wilderness, Ruisdael draws our eye into the far distance, via a shaft of sunlight over the cornfields, to a little village on the horizon where a church tower rises up. About Jacob Isaacksz. van Ruisdael From a family of successful painters, Jacob van Ruisdael is the most celebrated landscapist of the golden age. He developed innovative ways to describe the flat, waterlogged Dutch countryside, with its low horizons, vast, turbulent skies and brooding, twisted trees—and sparked a taste amongst collectors for a different kind of landscape. Ruisdael brought drama to his scenes by emphasising or even exaggerating the unpredictable, untamed beauty of nature. His huge skies, where sunlit, billowing white clouds dominate a clear blue expanse, are so distinctive that the Dutch still use the term ‘a Ruisdael sky’ to describe a day like this. For a perfect painting is like a mirror of nature. What’s going on at this rowdy family party? 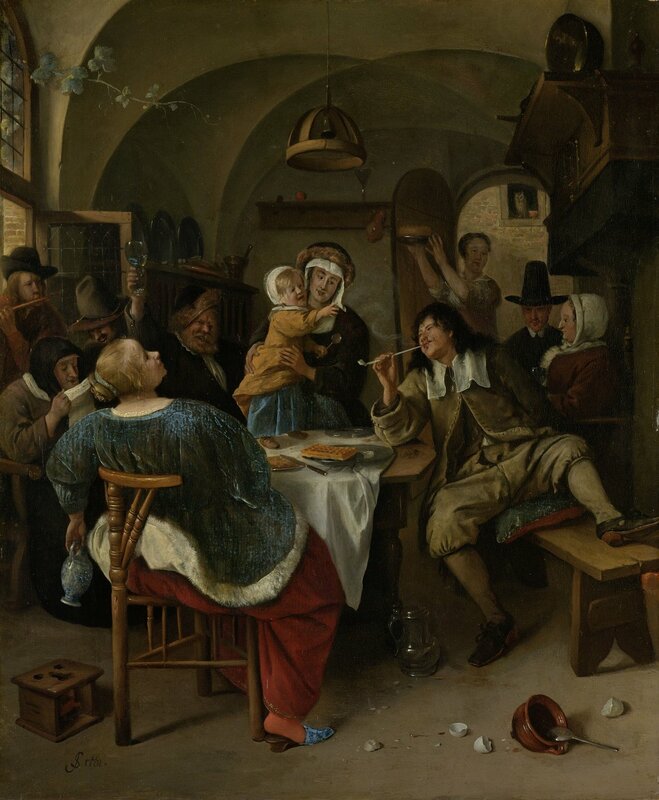 Here, Jan Steen exposes the spectacle of a rowdy family gathering. At the centre of the chaos, a mother restrains her toddler who stands on the table and reaches towards the plume of smoke curling up from the father’s pipe. It’s a clever illustration of the Dutch proverb: ‘as the old pipe, so pipe the young’, meaning that children mimic their parents’ behaviour. And here, the behaviour is less than ideal… In the foreground, a richly-dressed woman leans back in drunken abandon, a wine pitcher dangling from her hand. At the right foreground, an overturned bowl and broken eggs are evidence of the family’s carelessness. A servant girl carries a fresh pie into the room, but the over-indulged family have still left half-eaten waffles and pastries on the table. And in the background, a couple of sombrely dressed visitors seem to disapprove of this uncouth household. 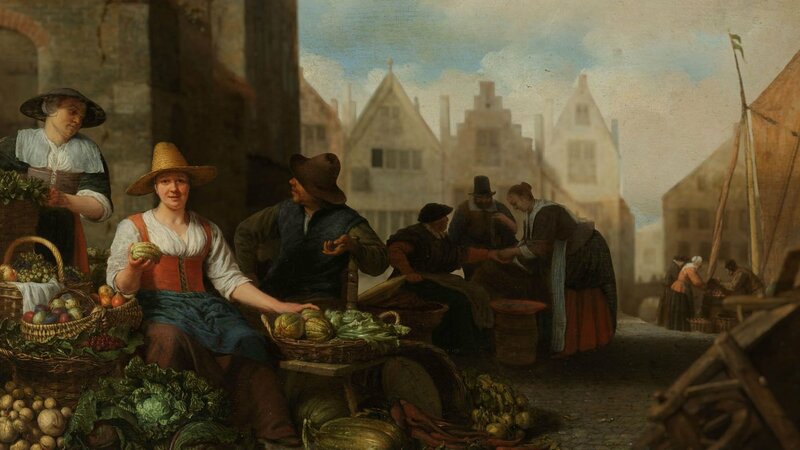 Prosperity gave the Dutch middle class access to a rather luxurious lifestyle, but over-indulgence was at odds with their values of temperance and humility. No painter illustrated this irony better than Jan Steen. About Jan Havicksz. Steen Born in Leiden in 1626, Jan Steen was the great comic painter of the golden age. He portrayed quirky Dutch habits, unruly families and drunken revellers and his paintings became satires of middle-class values and behaviour. Many scenes relate to contemporary popular theatre, including stock characters like pompous doctors, lovesick women, drunken revellers and fools. A very successful painter, he was given leadership positions several times in the Guild of St. Luke (the professional artists’ organisation that existed in every major city), but also pursued other interests. He owned a brewery in Delft and was involved with the rederijkers (a society for actors or orators), who clearly inspired some of his comic creations. Bathed in clear sunlight from an unseen window, a young woman is captured in a private moment at home. She clasps a letter with both hands, her lips slightly parted, creating an air of expectancy. But who is this letter from? Is the sender in some distant place, suggested by the map on the wall? And what are the letter’s contents, that keep the woman so absorbed? 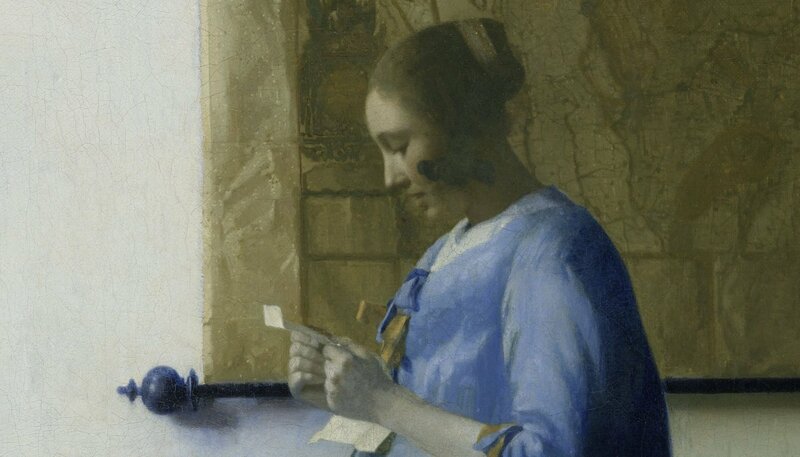 Vermeer’s Woman in blue reading a letter enchants us with its restrained, quiet beauty. Described mostly in shades of blue and ochre, the composition appears simple and natural, but it is in fact carefully constructed to create balance, harmony and stability. 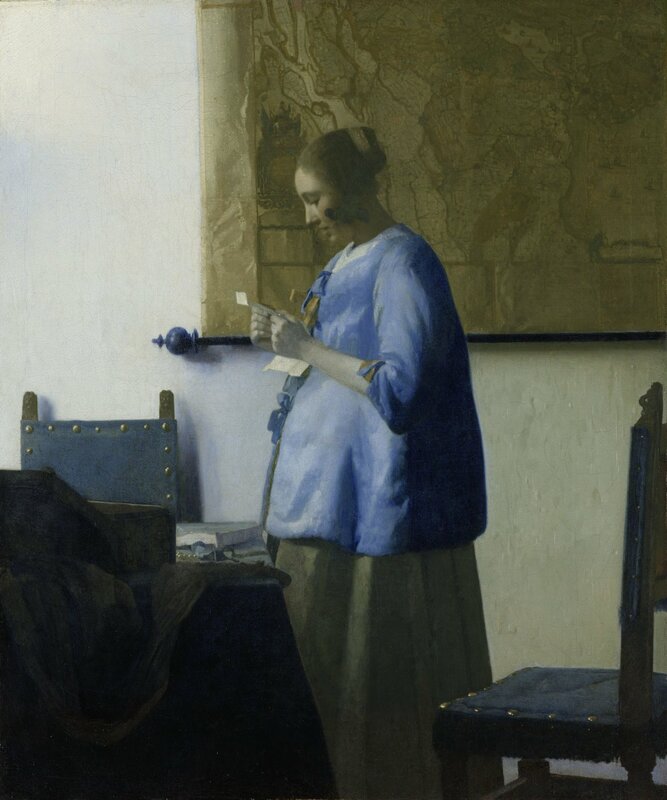 There are few hints as to the story behind the subject—like many of Vermeer’s paintings, an air of mystery hangs over the scene. We will never know the contents of this woman’s letter—and it’s exactly that mystery that keeps us intrigued. About Johannes Vermeer Johannes Vermeer is today considered as one of the most important painters in the history of Western art. But he was virtually forgotten for two centuries, only to be rediscovered in the 1800s by critics and artists (including fellow Dutchman Vincent van Gogh) who celebrated his eye for atmosphere, colour and composition. Vermeer created some complex allegories and sophisticated religious paintings, but he is best-known for his tiny paintings of single figures in an interior. In the 1660s, he painted a series of works each depicting a woman engaged in a humble daily activity: pouring milk, playing an instrument, making lace or reading a letter. Many Dutch artists made a specialty of observing such small pleasures of daily life, but Vermeer has become universally admired as one of the greatest of them. He excelled at creating the sense of a perfectly ordinary moment, frozen in time.